What does it take to be a winning youth coach? Listen in as Rich Clayton shares stories and discusses his journey to becoming a successful youth sports coach and athletic director. 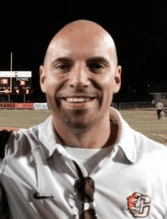 Rich has been coaching, teaching, and an athletic director for the last 16 years in California. He lost both his parents at a pretty early age, so coaches were a huge influence on his life. Rich grew up playing football, basketball, and baseball, and played Jr. College football. Rich is currently transitioning from a larger school district in California to a newer one – and he is excited about starting all over and developing new systems. It’s much different approaching kids as a coach vs. as a player. As a player – you can push teammates and call them out, but as a coach it’s a different dynamic so you have to change your approach. Think through your coaching philosophy before establishing any type of rules. Then involve the kids in creating any team rules. Then make sure you are fair, trustworthy, and equitable. Do rewards in groups as much as possible – i.e. offensive line, special teams, etc. Can my kid play college sports? Parents – know what the academic requirements are by middle-school. You need to have your child cleared by the end of their junior year. Rich’s senior year he got a pass interference call on 4th and 2 against the other undefeated team in his league. Still has no idea why he did it. Constantly be giving positive feedback to the kids. Show them what they are doing and where you are taking them. This entry was posted in Podcasts and tagged in athlete, baseball, basketball, Bill Belichick, Carol Dweck, cheerleading, coach, Coaching, coaching podcast, coaching your own child, coaching your own kid, dad, dad coach, daughter, ESPN, football, gymnastics, hockey, James Leath, lacrosse, mental toughness, mental toughness kids, Mindset, mlb, mom, mom coach, national alliance youth sports, nays, NBA, NFL, Parenting, pca, peak performance, Pete Carroll, podcast, podcasts, positive coaching, Positive Coaching Alliance, Rich Lawson, Sharif Williams, soccer, softball, son, sports, sports podcast, sports specialization, swimming, The Classic Guide to the Mental Side of Peak Performance, The Education of a Coach, The Inner Game of Tennis, volleyball, W. Timothy Gallwey, winning, Winning Youth Coaching, Winning Youth Football, youth, youth coaching, youth sports, youth sports podcast.